A patient with a history of peripheral vascular disease may have been at increased risk for this complication. Recent years have seen a dramatic rise in the use of intravitreal medications to treat retinal diseases.1 VEGF inhibitors have revolutionized the management of common ocular diseases such as neovascular age-related macular degeneration (AMD), diabetic macular edema, and macular edema associated with retinal vein occlusion (RVO). • Retinal vascular occlusions following intravitreal injection of anti-VEGF agents are rare. • To the best of the authors’ knowledge, this article presents the first description of a combined CRAO and CRVO after intravitreal injection of aflibercept in the management of neovascular AMD. • Research is warranted to evaluate the effect of VEGF inhibition on the retinal vasculature. 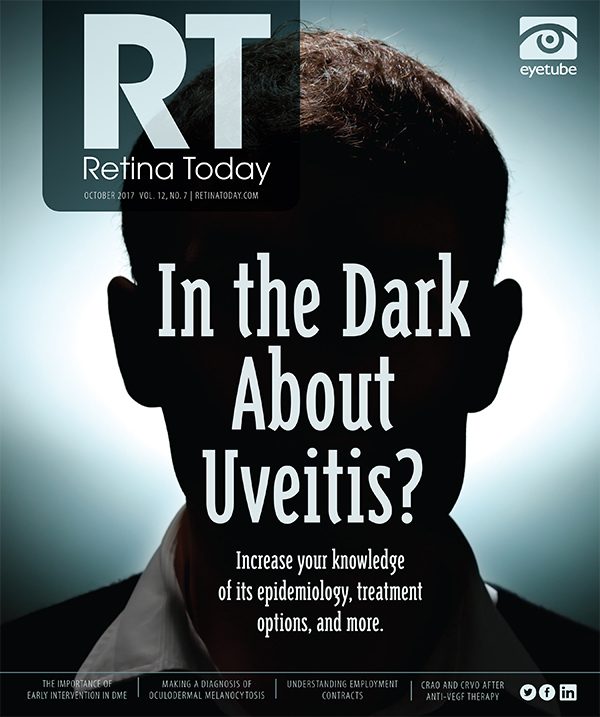 Despite a favorable safety profile, some studies have raised concerns regarding potential ocular and systemic side effects of anti-VEGF agents.2,3 Reports have suggested a causative link between injections of bevacizumab (Avastin, Genentech) or ranibizumab (Lucentis, Genentech) and retinal artery occlusion (RAO).3-5 In this article, we present, to the best of our knowledge, the first reported case of a combined central retinal artery occlusion (CRAO) and central retinal vein occlusion (CRVO) following intravitreal injection of aflibercept (Eylea, Regeneron) in the management of neovascular AMD. 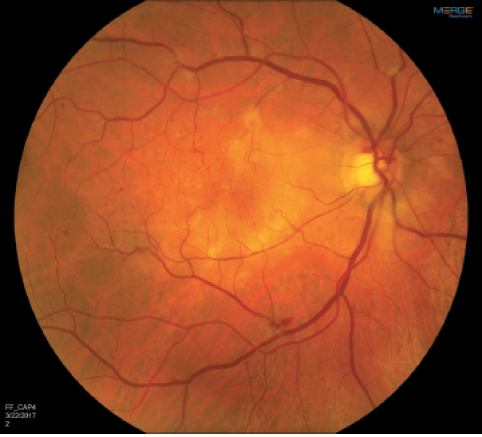 A 78-year-old man with a medical history of arterial hypertension, hypercholesterolemia, bicuspid aortic valve, deep vein thrombosis, and peripheral vascular disease had been undergoing therapy for neovascular AMD in the right eye (OD). On the day of an injection, ophthalmologic examination revealed best corrected visual acuity of 20/30 and intraocular pressure (IOP) of 14 mm Hg OD. Subretinal fluid was noted on clinical examination and confirmed with spectral-domain optical coherence tomography (SD-OCT) (Figure 1). The patient received an intravitreal injection of aflibercept with topical anesthesia. Figure 1. OCT OD before injection of aflibercept reveals drusen and subretinal fluid. Figure 2. Fundus photograph OD demonstrates retinal whitening in the nasal macula and parafoveal area with drusen and intraretinal hemorrhages. The patient, who is an excellent historian, reports that typically his vision “clears up” within 24 hours after injection. After this injection, however, it never did. He returned to the clinic 2 weeks after the injection reporting persistent decreased vision OD. His visual acuity in that eye had dropped to counting fingers. IOP was 18 mm Hg in each eye. Anterior segment examination OD revealed a deep and quiet anterior chamber with a 2+ nuclear sclerotic cataract. Fundoscopic examination was notable for a lack of vitreous inflammation, an optic disc with sharp margins, a cup-to-disc ratio of 0.7, and parafoveal retinal whitening with the presence of a cherry red spot (Figure 2). Scattered intraretinal hemorrhages were seen in the posterior pole and periphery, along with mildly dilated and tortuous retinal veins. Fluorescein angiography (FA) OD revealed a marked delayed transit time of 40 seconds, poor arterial and venous perfusion, early blocked fluorescence, and hyperfluorescence without late leakage (Figures 3 and 4). SD-OCT imaging revealed drusen without intraretinal or subretinal fluid and nasal hyperreflectivity of the inner retinal layers consistent with acute ischemia (Figure 5). The patient was diagnosed with combined CRAO and CRVO. Figure 3. 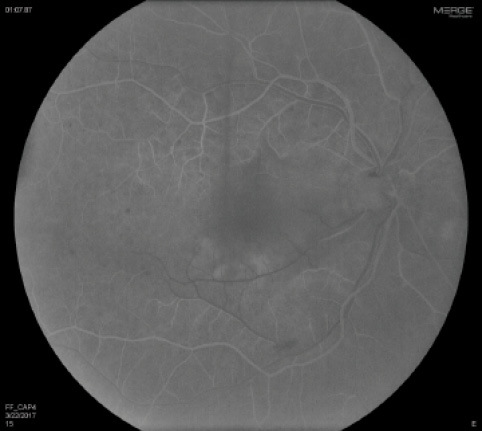 FA OD reveals lack of retinal filling at 49 seconds, indicating a perfusion delay. Figure 4. 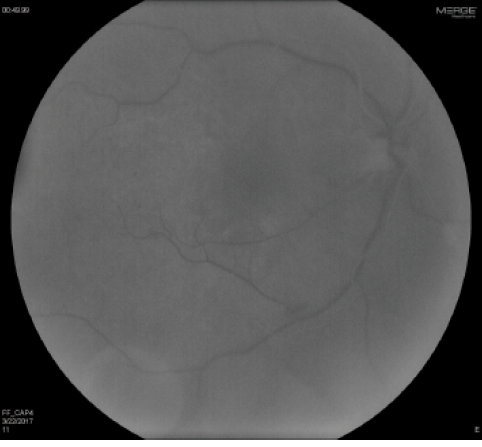 FA OD demonstrates delayed transit time and incomplete filling of the retinal arterioles, most notably inferonasally. Figure 5. OCT OD shows nasal hyperreflectivity of the inner retinal layers consistent with acute ischemia. Given the patient’s age and the unusual presentation of combined arterial and venous occlusions, giant cell arteritis (GCA) was high on the differential diagnosis. Erythrocyte sedimentation rate and C-reactive protein were within normal limits. There were no systemic symptoms suggestive of an inflammatory process. An embolic workup that was performed in conjunction with the patient’s cardiologist, which included a carotid ultrasound and transesophageal echocardiogram, demonstrated significant aortic stenosis, which was unchanged from previous workups. On the last follow-up visit the patient’s visual acuity was counting fingers at 3 feet, his IOP was 20 mm Hg, and retinal findings were unchanged from previous examinations. The patient will be followed periodically to monitor for signs of anterior or posterior segment neovascularization as per standard protocols. This report presents a case of combined CRAO and CRVO following an intravitreal injection of aflibercept. Retinal vascular occlusions following intravitreal injection of anti-VEGF agents are rare. In 2006, The International Intravitreal Bevacizumab Safety Survey reported a single case of CRAO after 7113 injections.2 That case description was the first report of a CRAO following aflibercept injection. Mansour and coworkers3 reported vascular events (RAO and RVO) occurring from zero to 55 days after intravitreal bevacizumab injection. Of note, all patients in that case series had preexisting ocular or systemic risk factors for retinal vascular events. The authors suggested a number of hypotheses to account for the retinal vascular occlusions, including underlying systemic or ocular disease, a postinjection IOP spike compromising an already impaired retinal perfusion, and/or a vasoconstricting effect of bevacizumab. Intravitreal anti-VEGF agents are used to suppress angiogenesis and vascular permeability in the retinal vasculature.6 However, VEGF plays a physiologic role in the maintenance of normal retinal microvasculature,6,7 and concerns have been raised with regard to potential vascular consequences of VEGF inhibition. Soliman et al8 analyzed retinal vascular constriction after injection of bevacizumab and reported a non−statistically significant trend toward decreased retinal vessel diameter at 1 month after injection. Papadopoulou and colleagues5 reported significant retinal arteriolar constriction after intravitreal injection of ranibizumab for AMD. Retinal arteriolar diameter continued to narrow until day 90 after the first injection (30 days after the third injection), suggesting a cumulative effect in patients who receive recurrent injections. A transient, volume-related IOP spike has also been proposed as a potential risk factor for postinjection occlusion of the central retinal artery.3 These transient IOP changes appear to be safely tolerated by most eyes. Falkenstein et al9 studied changes in IOP after intravitreal bevacizumab injections in 122 eyes. They reported a mean IOP of 36.3 mm Hg measured 3 minutes after injection. By 15 minutes, IOP had returned to less than 30 mm Hg in all eyes. Patients with preexisting ocular hypertension may be at increased risk for postinjection IOP spikes. In the patient described here, a thorough evaluation was performed to rule out GCA and any cardiac or carotid source. Results were normal. This patient is a vasculopath with a history of significant peripheral vascular disease and moderate aortic stenosis, which may have increased his risk of complication. These risk factors independently predispose a patient to RAO, and their presence may also potentiate the effects of VEGF inhibition on the already compromised retinal vasculature. Previous reports have focused on retinal arterial constriction and vascular events after injection of bevacizumab or ranibizumab. It is likely that aflibercept-mediated VEGF inhibition results in similar effects on the retinal vasculature, although evidence is lacking. This article represents the first reported case of CRAO after intravitreal aflibercept injection for neovascular AMD. Although they are rare, retinal vascular events should be considered as potential complications of intravitreal anti-VEGF therapy. Further research is warranted to evaluate the effect of VEGF inhibition on the retinal vasculature and to assess the clinical implications of these changes. 1. Campbell RJ, Bronskill SE, Bell CM, Paterson JM, Whitehead M, Gill SS. Rapid expansion of intravitreal drug injection procedures, 2000 to 2008: a population-based analysis. Arch Ophthalmol. 2010;128(3):359-362. 2. Fung AE, Rosenfeld PJ, Reichel E. The International Bevacizumab Safety Survey: using the internet to assess drug safety worldwide. Br J Ophthalmol. 2006;90(11):1344-1349. 3. Mansour A, Bynoe L, Welch J, et al. Retinal vascular events after intravitreal bevacizumab. Acta Ophthalmol. 2010;88(7):730-735. 4. Shima C, Sakaguchi H, Gomi F, et al. Complications in patients after intravitreal injection of bevacizumab. Acta Ophthalmol. 2008;86(4):372-376. 5. Papadopoulou D, Mendrinos E, Mangioris G, Donati G, Pournaras C. Intravitreal ranibizumab may induce retinal arteriolar vasoconstriction in patients with neovascular age-related macular degeneration. Ophthalmology. 2009;116(9):1755-1761. 6. Von Hanno T, Kinge B, Fossen K. Retinal artery occlusion following intravitreal anti-VEGF therapy. Acta Ophthalmol. 2010;88(2):263-266. 7. Ferrara N. Vascular endothelial growth factor: basic science and clinical progress. Endocr Rev. 2004;25(4):581-611. 8. Soliman W, Vinten M, Sander B, et al. Optical coherence tomography and vessel diameter changes after intravitreal bevacizumab in diabetic macular edema. Acta Ophthalmol. 2008;86(4):365-371. 9. Falkenstein IA, Cheng L, Freeman WR. Changes of intraocular pressure after intravitreal injection of bevacizumab (Avastin). Retina. 2007;27(8):1044-1047. 10. Varma D, Cugati S, Lee AW, Chen CS. A review of central retinal artery occlusion: clinical presentation and management. Eye (Lond). 2013;27(6):688-697. • second year retina fellow at The Retina Group of Washington, Washington Hospital Center, Georgetown University Hospital program in Washington, D.C.
• chief resident of ophthalmology at Georgetown University Hospital in Washington, D.C.